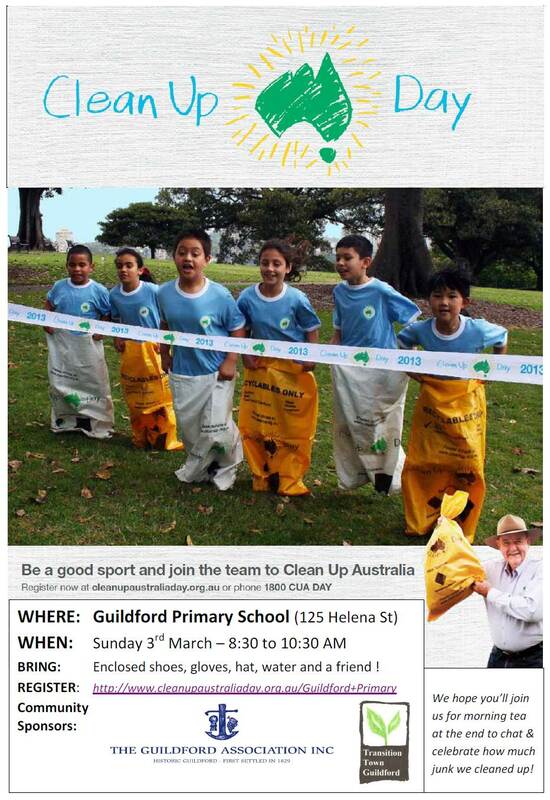 Building on the success of previous years, Transition Town Guildford and the Guildford Association will be hosting a Clean Up Australia day site around the Guildford Primary school (125 Helena street). Sign up on the CUAD website or see you on the day. The East Metropolitan Regional Council are running computer and television recycling days across the member councils (Bayswater, Belmont, Bassendean Kalamunda, Mundaring, Swan). Bring your e-waste along this weekend (23 and 24 February) to one of the Tech Collect locations to have it recycled for free. All computer equipment and accessories, cables, printers, scanners and TVs accepted. City of Swan Location – Jack Williamson Oval, Eveline Road, Middle Swan. When: 9 am to 4 pm all weekend. More info here, all locations here. And on the 9th of March the City of Swan are having another Recyclable goods drop off day. See the Upcoming Events page for details. This entry was posted in Event, Take Action, Waste & Recycling and tagged City of Swan, Clean up Australia day, e-waste, East Metropolitan Regional Council, Guildford Association, Guildford Primary School, Helena street, Recyclable goods drop off day, Tech Collect. Bookmark the permalink.